A crate is an invaluable tool for you and your dog – it can give them a safe, secure place to rest as well as peace of mind for you that they can’t get up to mischief when you’re not looking, and can be a great help with housetraining. Introduced correctly, and not used as a punishment, a crate can be your dog’s ‘safe haven’; a space they can choose to go and sleep, knowing that they won’t be disturbed. For dogs who are scared of fireworks or thunderstorms providing them with a safe haven can be enough to help them cope and eliminate their distressing panting and pacing. In addition, many dogs need to learn how to mentally relax as opposed to simply sleeping because of physical tiredness. You can teach your dog to relax, both in and out of a crate. If you want to teach relaxation on a bed rather than a crate the technique will work in the same way. The same technique can also be used for teaching relaxation in the car, or any other space where you want your dog to feel comfortable, safe, secure and relaxed. The aim of this training is not to teach your dog to simply tolerate being in a crate, but to create an association with calmness, relaxation and security within the space. If you are revisiting crate training with a dog who has previous negative associations with a crate then try to change the way the crate looks and feels to your dog. Can you change the position of the crate, use an end door instead of a side door for him to enter it, cover it (or remove a cover if used before), as examples? If you have previously used his bed as a time out or punishment for bad behaviour then we suggest you buy a new bed specifically for his crate and do not use the crate as a punishment space in the future. To undo previous bad experiences may take time so be prepared to go at your dog’s pace, and persevere because it will be worth it when your dog chooses to go and relax or sleep happily in their crate. Choose a warm, cosy location for his crate, somewhere he can be part of the family but without too much passing traffic or noise. Avoid placing the crate next to a washing machine or in a busy passageway. Some dogs find an ADPATIL™ diffuser beneficial and will relax more quickly if one is placed near to their crate. Most of the time you can leave the crate door open so that your dog can come and go from his crate as he chooses. It is worth ensuring he is comfortable in the crate with the door closed too, especially if you are introducing the crate for a puppy to help with settling them in, keeping them out of mischief, and housetraining. Set the crate up in your chosen location, place a comfy bed and something that smells of you (an old T-shirt for example) inside and leave the door open. Many dogs will take the opportunity to investigate the new object, so be ready with treats to reward any interest in the crate, dropping treats just inside at first, and gradually moving them further in as his confidence grows. If you have plenty of time for crate training, and no other dogs in the house, you can leave high value chews in the crate for him to find. After a few repetitions you’ll see him start to investigate the crate with positive anticipation of finding something good. Try to encourage him to walk in himself. If he does, make a huge fuss of him and continue to feed him treats while you close the door and also continue once the door is shut. If you are short of time you can lure him into the crate with high value treats, or, if it is possible (particularly if he is not that food motivated), make his first introduction at a meal time and place his food bowl (with high value food added to his normal meal) inside. In an emergency, if he is reluctant to go into the crate, try to very gently lift him in (ONLY if this does not pose a risk to him or you) and then feed him treats through the closed door. The first time you close the door of the crate, plan to sit next to it for a while to keep him company and feed him treats or give him a stuffed food toy or chew to keep him settled. In general, open the door before he has finished his chew and let him choose when to leave the crate, but if you need to crate train rapidly for some reason, once he is engaged with the chew or toy, you can move away from the crate but always return before he shows signs of becoming agitated or distressed. You are trying to avoid him becoming frustrated or anxious about being in the crate so at this stage you need to stay with him and provide reassurance by your presence or entertainment through food toys and chews. You will be able to leave him for longer as he adjusts and learns how to relax by himself. When training at first, leave the door open at all times, and reward him any time you see him heading in to the crate. Close the door when you give him a food toy or chew in there, or you have a few minutes to practice relaxation in the crate. At first choose your practice times so that he is likely to be relaxed or tired, for example after a walk or a training session. He will probably be quite alert to start off with, sitting or standing in the crate, watching for the treats to arrive. Deliver the treats in a slow, gentle way, directly on to the bed in front of him. Try not to ask him to lie down, but encourage it by the way you place the treats. You can wait a while between treats and see if that delay prompts him to lie down. As soon as he does lie down, deliver a treat directly to him again. Gradually increase the delay between treats, and start to reward signs of relaxation such as his head dropping, moving on to his side or even deep breaths. As he gets more practice, and reward, for being relaxed in his crate you can start to wait for relaxation before giving the first treat or a chew. Remember that you are not just looking for him to lie down; you are looking for signs of emotional relaxation too. If treats are too arousing for him then use gentle strokes – if you can reach him through the bars of the crate – or just a relaxing tone of voice and interaction with you to reinforce the behaviour. If necessary, remove his bed from the crate and teach this on the bed first, so you can stroke him if that is reinforcing for him, and then put the bed back in the crate to continue with this training. Slowly increase the amount of time he spends in the crate as he gets more relaxed in there. Only open the door to his crate if he is calm and relaxed. It is normal for him to become excited at the prospect of being allowed out but you can help him learn self control and good manners if you wait for him to be calm before undoing the latch. If he risks injuring himself, then use food scattered in to the back of the crate to divert his attention while you open the door. In an emergency or with a young puppy, while he’s adjusting to being confined and to save distress and noise disturbance all round, you may need to sleep alongside the crate so that he does not need to bark or howl out of frustration or because he’s isolated. Trying to ignore vocalisation and leave him to bark is a risky strategy because he may escalate his behaviour and try to chew or dig his way out and hurt himself in the process, or his barking may last longer than your ability to ignore it. If you then go to him, you will have taught him that barking works. Equally, leaving him to bark or howl is leaving him in distress and allowing him to practice a behaviour that most of us don’t want our dogs to do; and practice makes perfect. Rather prevent the barking and slowly wean him away from your presence over time. Puppies, especially, need time to settle and feel secure in a new house so having them sleep in your bedroom for the first few weeks is fine – you can always move the crate out of the room slowly once they’re a bit older. 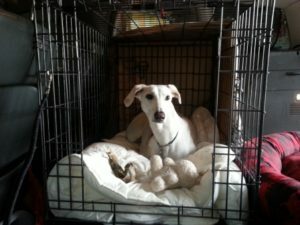 If you have the crate alongside your bed you will also hear if they have woken and need to go to the toilet which means you can take them outside immediately and speed up house training. We do not recommend using any form of punitive anti-bark device as part of crate training – its primary function is to be a safe, secure, relaxing and comfortable place to be. Using any form of punishment in this environment is counter-productive and potentially damaging to your dog’s emotional wellbeing. I have confidence part one – what is good puppy socialisation?